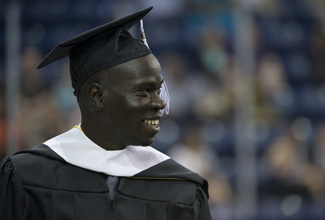 The University of Notre Dame’s Graduate School recognized 389 master’s and 209 doctoral degree recipients and presented several awards during Commencement ceremonies Saturday (May 19) in the Compton Family Ice Arena. Thomas Quinn, M.D., director of the Johns Hopkins Center for Global Health, delivered the Commencement address. He also was recognized as the recipient of the Graduate School’s Distinguished Alumnus Award. 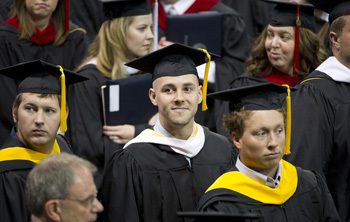 Quinn, who earned bachelor’s and master’s degrees from Notre Dame, chose “Carpe Diem” or “Seize the Day” as his message. He discussed four topics under that theme: family, mentorship, collaboration and career. Regarding family, Quinn urged those who were graduating to thank their families. And he urged their parents to support the graduates’ passion for their work. In discussing mentorship, Quinn described being mentored by the late George B. Craig Jr., a Notre Dame faculty member who was an internationally recognized expert on the biology and control of mosquitoes. “I am absolutely sure that there are at least one or more professors who have made an indelible mark on your life,” he said. “George Craig was such a person to me, and I honor him today. Quinn also suggested that the graduates consider collaboration. In discussing career, Quinn urged the graduates to stay true to their passions and learn from their failures. The recipients of several Graduate School awards also were recognized during the Commencement ceremony. Prashant Deshlahra, a chemical and biomolecular engineering Ph.D., was the recipient for engineering. His research focused on novel ways to manipulate the activity of heterogeneous catalytic materials. He is currently a postdoctoral researcher at the University of California at Berkeley with Enrique Iglesia, a leading researcher in the area of heterogeneous catalysis. In the humanities, the recipient was Hilary E. Fox, an English Ph.D., who has provided groundbreaking insights into medieval concepts of mental activity and understanding. She has accepted a position as a collegiate assistant professor at the University of Chicago. Timothy Wencewicz, a chemistry and biochemistry Ph.D., whose work is in the area of developing antibiotic chemotherapies based on new scaffolds and microbe-targeted drug delivery techniques, was the recipient in the sciences. He has earned a postdoctoral position at the Harvard Medical School with Christopher Walsh, a prominent scholar in the fields of enzymology and pharmacology. In the social sciences, Carlos Gervasoni, a political science Ph.D. who completed a synthesis of research on democratization at a sub-national level, focused on his home country of Argentina, was the recipient. He is now an assistant professor at the Universidad Torcuato di Tella, Argentina’s finest social science institute and one of the best universities in all of Latin America. James VanderKam, John A. O’Brien Professor of Hebrew Scriptures, and John Van Engen, Andrew Tackes Professor of Medieval History, were honored as co-recipients of the University’s 2012 Rev. James A. Burns, C.S.C. Graduate School Award. 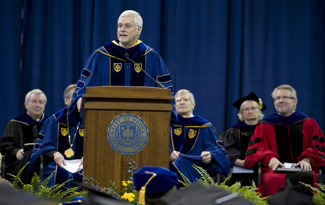 The award is given annually to a faculty member for distinction in teaching or other exemplary contributions to graduate education and honors the first Notre Dame president with an advanced degree. Brian Baker in the Department of Chemistry and Biochemistry was recognized as this year’s Director of Graduate Studies Award winner and Tracy Cabello was named recipient of this year’s Graduate Administrative Assistant Award. Originally published by William G. Gilroy at newsinfo.nd.edu on May 19, 2012.